Description of "Blogging For Small Business"
Today the newsmakers are not the big media publishers. They are the independent publishers, writers, authors, bloggers, experts who take the time and trouble to get their voice out online. She is an online publisher, with a passion for blogging and content marketing and, since 2001, has created award-winning websites, newsletters, blogs, email courses and ebooks, and been interviewed for her blogging expertise. Priya graduated with a degree in Biochemistry from Bombay University and completed her Post-Graduation in Biotechnology from Goa University. She also has Diplomas in Journalism, Advertising and Public Relations. Priya is passionate about inspiring and empowering Indian women to look beyond their limitations and live their best lives. She lives in Pune, India, with her husband, daughter and dog. 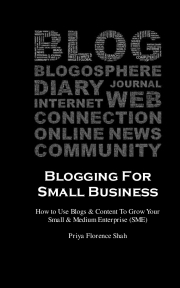 Reviews of "Blogging For Small Business"
I have had the privilege to assess and peer review a draft copy of the e-book 'Blogging for Small Business'. This book is a valuable resource by a credible expert author in the field of social media. The reflective prose makes it easy for owners of small businesses, to consider options suited to their business and niche. In an otherwise competitive market, this book is a valuable tool for any business, who wants a proactive and success-proof social marketing experience.